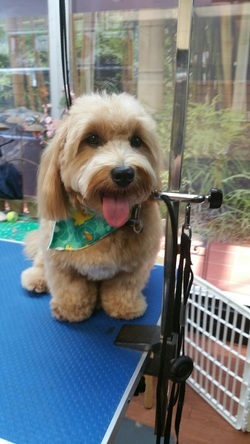 Honolulu Dog Grooming | Live.Love.Pet! | Honolulu, HI - Live.Love.Pet ! Hawaii's Only 'Zen' Grooming Spaw & Boutique! Dog Grooming - Show Your Dog Love with a Live.Love.Pet! Spaw Day! Whether you live in Kaimuki, Manoa Valley, Palolo, Waikiki, Makiki or Hawaii Kai, contact us today to schedule your dog's first Honolulu pet grooming appointment! You want your dog to look and smell nice, but you also want your Furry Best Friend (FBF) to be cared for. That’s exactly what you’ll get at Live.Love.Pet! – the best dog grooming salon in Honolulu, Hawaii. We are completely transparent when it comes our pricing. We have the fairest and most consistent pricing schedule in Hawaii. The amount you pay will be based on your pet’s size and coat type according to the scale below. Ask about your dog’s actual price today! From massage baths to tear build-up removal to deshedding, we can do it all. Choose from one of the following packages and give your dog a Honolulu pet grooming appointment to remember. Barkin’ Birthday – A Complimentary Upgrade Worth $30!!! The prices above are averaged and subject to change based on your dog’s coat type and temperament. To learn your dog's actual pricing and to schedule a Honolulu dog grooming package today, call Live.Love.Pet! at (808) 734-8282. Visit Live.Love.Pet! today and give your pet a Spaw Day to remember! *Prices above are averaged and subject to change based on coat condition and temperament. Exact pricing will be determined at evaluation based on breed or by coat type if mixed breed. Additional fee for hand-stripped dogs. Additional gratuities for exceptional service accepted.